This is our custom LEGO minifig kit. 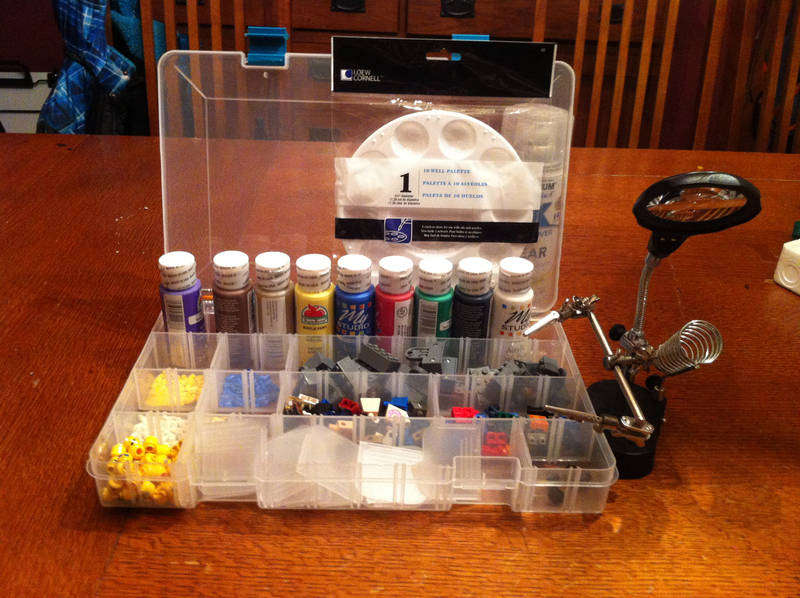 It includes a clear gloss primer (to help the paint adhere to the plastic figures), acrylic paint, a paint well, small brushes, and several minifig parts I found on eBay. I also included a soldering stand to help with the detail work. So, my younger son turns eight this week. He’s been after me for a while to help him make custom LEGO minifigures for the characters that are unavailable from LEGO (or hard to find). This is what I came up with. I found out that I could buy a bunch of random LEGO minifig parts on eBay for a really good price. So bought a bunch of heads, torsos, hands, arms and legs. Then, I picked up some acrylic paint, a paint well and some small brushes. I’m using a clear paint primer to try to get the acrylic to stick to the plastic (and then protect it when it’s dry). I organized them in a crafter’s box with adjustable compartments. Finally, since I have no illusions as to who’s going to be working alongside him during this, I picked up a soldering stand. It’s a weighted stand with a magnifying glass, a small LED light, and two adjutable alligator clips. I figure this will make it easier to hold the small parts steady while we paint those teeny tiny details. I don’t think we’re going to give Evil Inc arch-henchman David Oakes a run for his money anytime soon, but I’m really looking forward to the time I get to spend with my kid letting out imaginations run wild. I’ll be sure to post some of the results here as soon as we get our first attempts done. You can also buy many other LEGO pieces on Bricklink it is the destination for when you need a specific pieces. There are thousands of sellers of LEGO on Bricklink. I am part of CactusBrick and we are adult fans of LEGO. We do city/train layouts currently in the Phoenix, Arizona area. We will be at Phoenix Comcion in June. We are usually right next to the 501st (The Star Wars pavilion). You want to get some 400 grit sandpaper, to remove any existing details. And maybe some 600 grit to smooth it down afterwards. Even if you aren’t taking anything off, you should scuff the surface just a bit to give the paint something to adhere to. You may also want to try model acrylic paints, like Tamiya, Testor’s Model Master, or Gunze Sangyo. Future™ floor polish works really well to as a final varnish. 3M makes really nice softback foam sanding sponge. And sand under the running water to wash away the dust. You might want to put a layer or two of heat shrink tubing on the alligator clips. The raw jaws can be aggressive and leave marks. The most common kind shrinks about 50% in diameter.